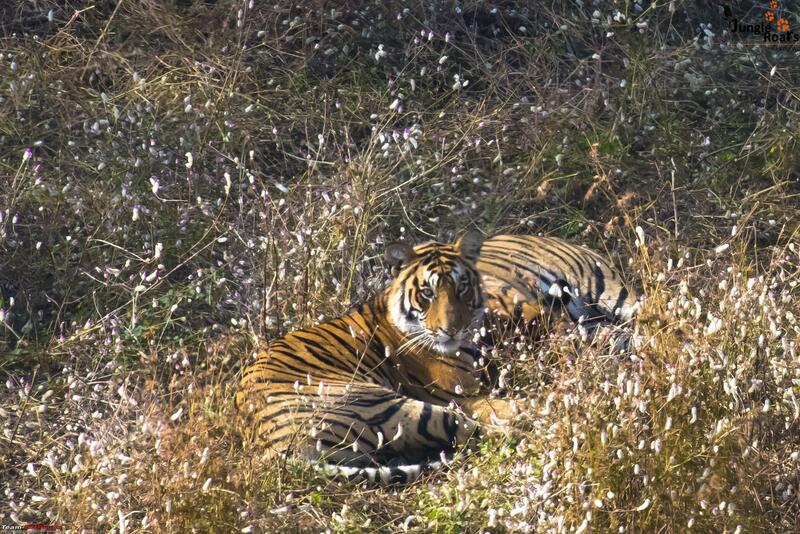 Winter trips to the tiger reserves have always yielded mixed results for me. 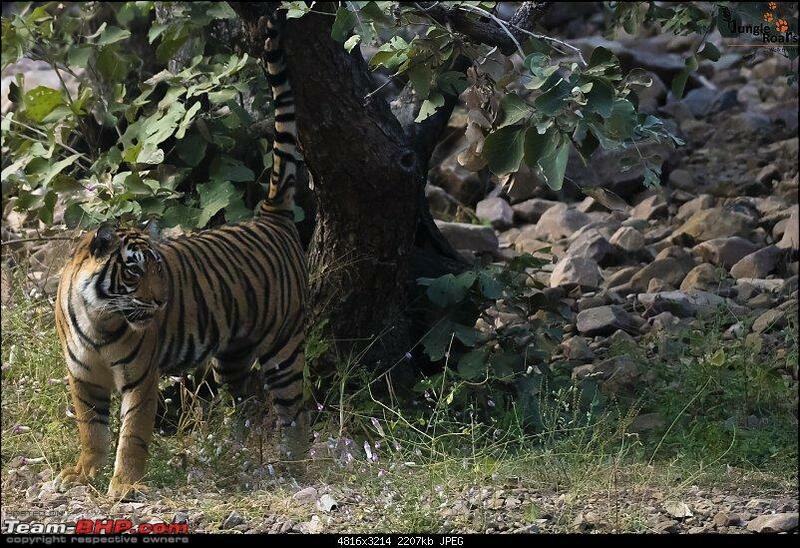 Thick foliage and better availability of water everywhere makes tiger sighting difficult. At the other end, winter coat on animals, green background and lush green forest make such trips more pleasant and rejuvenate me. Beside all these, there are few forests which have become my second home and I must visit them regularly. 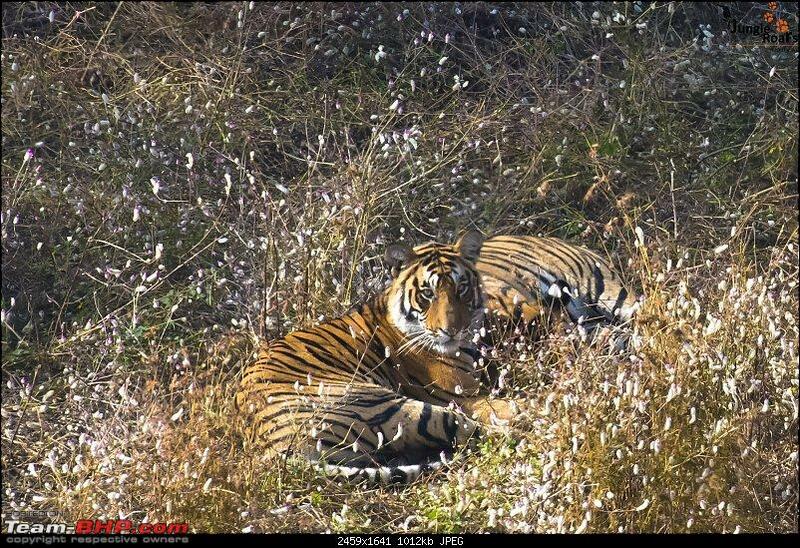 This winter was no different and I had planned Ranthambhore and Bandhavgarh (travelogue here (Wandering in the wild : Ahmedabad to Bandhavgarh)) apart from my regular Thol lake and Nal Sarovar visits. 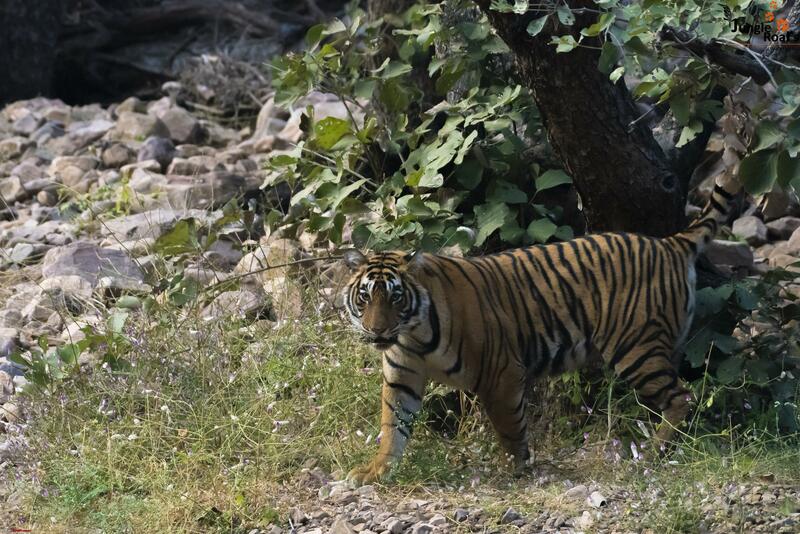 Out of the lot, first was Ranthambhore. Got the Ciaz thoroughly checked. Stuffed the bag pack. Prepared the camera bag and here I am ready to wander into the wild. I planned to take following route. I started around 7 AM. The drive was uneventful. I had breakfast at Shamlaji border, lunch at Chittorgarh, a small break after Kota and I reached Sawai Madhopur around 7:00 PM in the evening. => Roads in Gujarat till Shamlaji Border are excellent. => After crossing border till Udaipur, road widening work is going on almost everywhere. Few places you will see long truck traffic. => Once you reach near Udaipur, there is a bypass for Chittorgarh. A small junction without any traffic management and you will find yourself surrounded by hundreds of two-wheeler, trucks and everybody is hell bent on not allowing others to move forward. It wasted almost 45 minutes for me. => Roads after Udaipur has diversion at almost every 2 KM and speed breakers everywhere will welcome to slow you down till Chittorgarh. =>Chittorgarh to Kota road is awesome. You can cruise here with triple digit speed and reach Kota in no time. I checked-in to Raj Palace in Ranthambhore. It was very nice stay with very good food. It also provides covered parking (Note : I am not attached to this property and I am just sharing my experience). We were a group of 23 like-minded people for this expedition. Others were traveling by flight/trains and they reached next day. Our first safari was an afternoon safari in Zone 2. We started from our resort around 2:30 and around 3 we entered core zone of park through famous Singh Dwar. Even in core area, main road or fort road is open for all since fort visit allowed to everyone. Just 1 KM before the fort, we took a right for our zone. We passed through back side of the fort. The lights were also tricky since it was a dense forest. We drove through various parts of the forest in search of pristine denizens. Sambar deer, Spotted deer, wild boars, peacocks, jungle fowls and langurs were common sight. 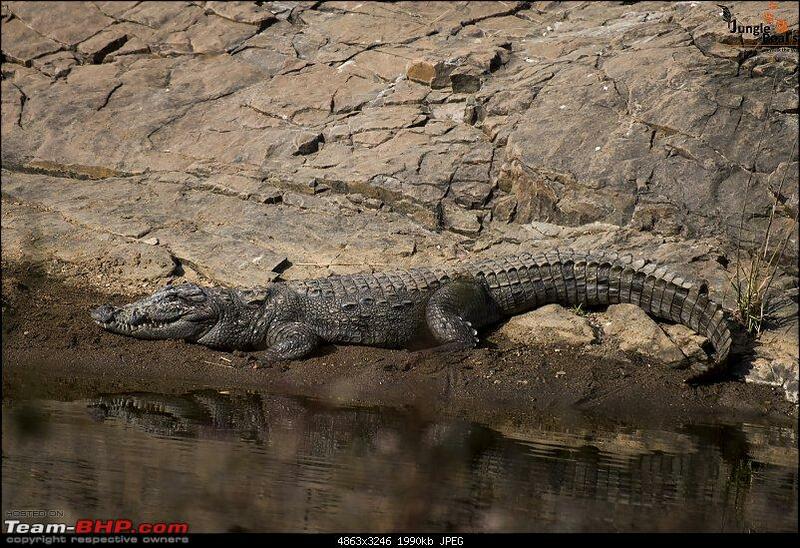 Around few water bodies, we also sighted crocodiles. 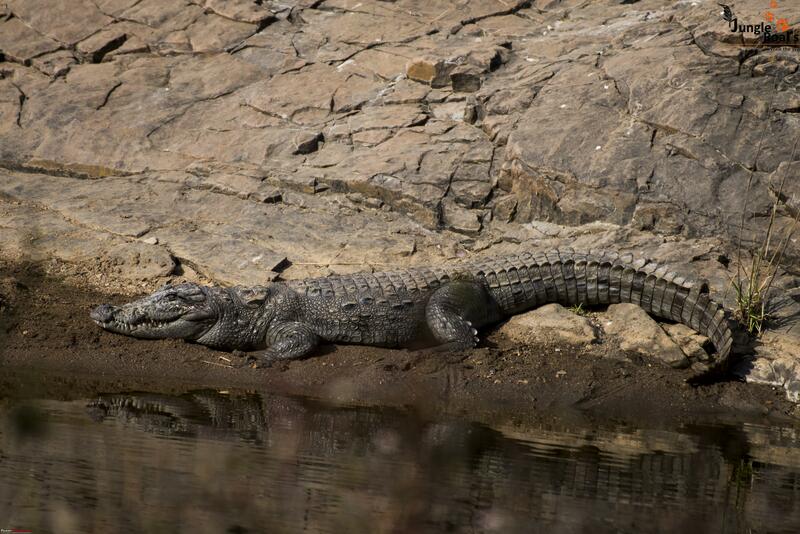 I always feel that Ranthambhore is a place where I can see crocodiles and sloth bear easily compared to other parks. Number of Sambar deer were much higher and they were in herds in Ranthambhore compared to other parks. We sighted one sloth beer climbing a small hill somewhere around Phoota Kot. Since lights were not favorable and bear was climbing in opposite direction to our gypsy, I didn’t try to click it and simply enjoyed that wonderful sight. Around 4:30 PM, we reached to end point of our zone. We stopped at a forest check post to gather information about movement of animal and possible sightings. We were talking with the guard posted there and suddenly we heard a Khonkkk sound. 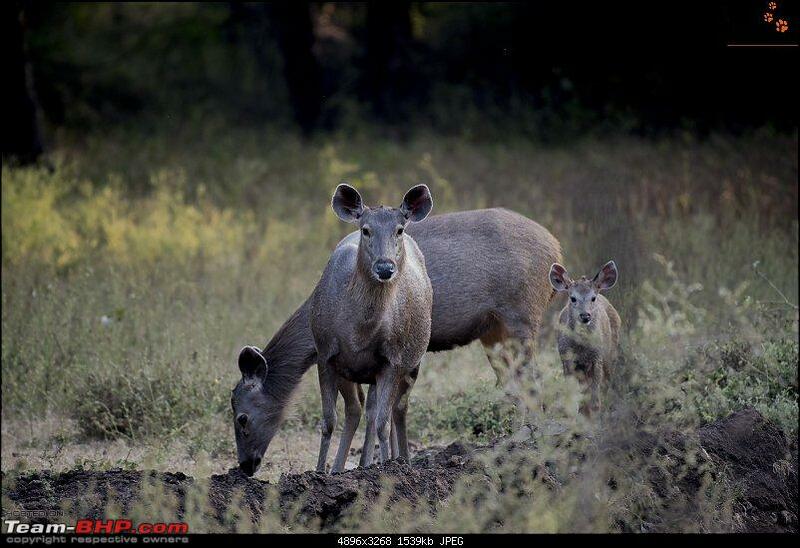 We were sure of sambar deer call. We immediately moved our gypsy to the area from where the sound was coming. We reached to the spot near Phoota Bandha. The alarm call was prominent and frequent. Since, I can trust sambar deer alarm calls, I instructed our driver to shut the engine off and stay there only. We were waiting at an open area observing a dry riverbed. Suddenly we heard growling of tiger (or possibly tigers) inside thick bush. All the deers standing were also looking into that direction. We were not sure on what was happening inside. Suddenly all the deers started running here and there. 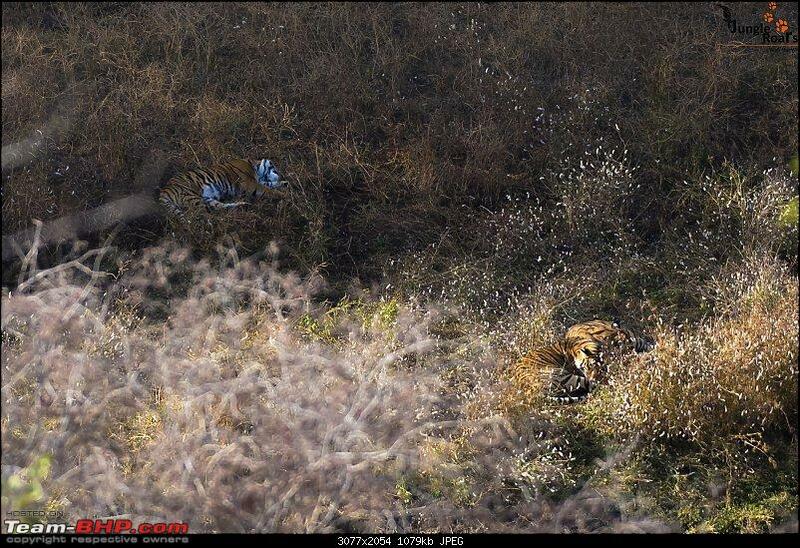 Surprisingly we also saw one tiger running along with deers. 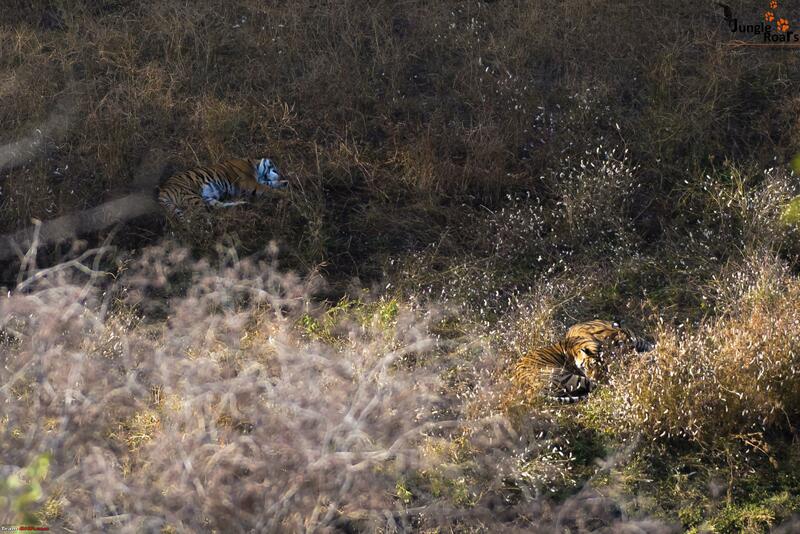 Before we realize anything, another tiger appeared from behind and started running behind first tiger. Our driver swiftly moved the gypsy to that direction. Since we can only drive the gypsy on designated route, it took us almost 2-5 minutes to reach to the spot where the tigers had gone. We reached there and what we saw was an amazing sight. The area belonged to a tigress called T-60. 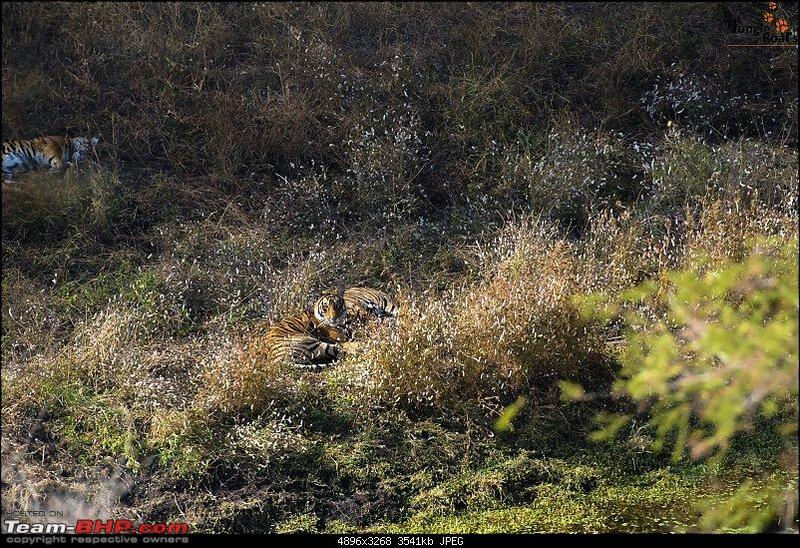 She had made a kill recently and another sub-adult tigress locally called Noorie (female cub of the tigress Noor) was trespassing her territory to have the party with the rotten kill. T-60 was pushing Noorie out of her territory. 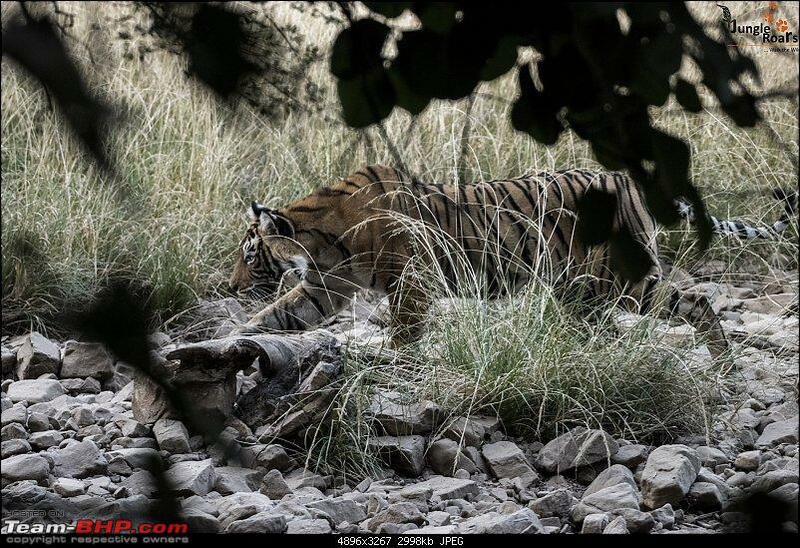 Any day, it was T-60 since she is more experienced and powerful tigress compared to Noorie who has just started learning the tactics of forest. Unfortunately I couldn't capture both in one frame. I could capture T-60 in pouncing mode and Noorie in territory marking mode. Since Noorie was out of her territory now, T-60 started moving back. It was time for us also to come back to the resort. In winters, the temperature and lights suddenly drop in forest and it takes no time for a sunny afternoon converting into chilly evening. I came back to the resort and shared our experience to others. Everyone was very happy since all the gypsies had wonderful sighting in their respective zone. We were reviewing photographs, discussed about parameters like metering, exposure settings and importance of ISO in dropping lights over cup of tea. I had made a presentation on exposure compensation and auto-ISO and its impact on result. We had campfire along with a movie about famous tigress Machhli (RIP). Had quick dinner and retired for the day since we had early Morning safari planned next day. Everybody was up and ready around 5:30 AM and had a hot cup of tea. It was literally freezing cold and chilly winds flowing. I will be visiting zone 4 today. We slowly started moving inside zone 4. We passed through Malik Talab, Lakkarda, Berda. It reminded me of famous mother Macchli. I saw her few times at and around Lakkarda. Denizens like spotted deers, sambar deers, crocodiles, pond herons, cormorant, Indian roller, kingfisher greeted us. At Lakarda, I sighted a sloth bear. 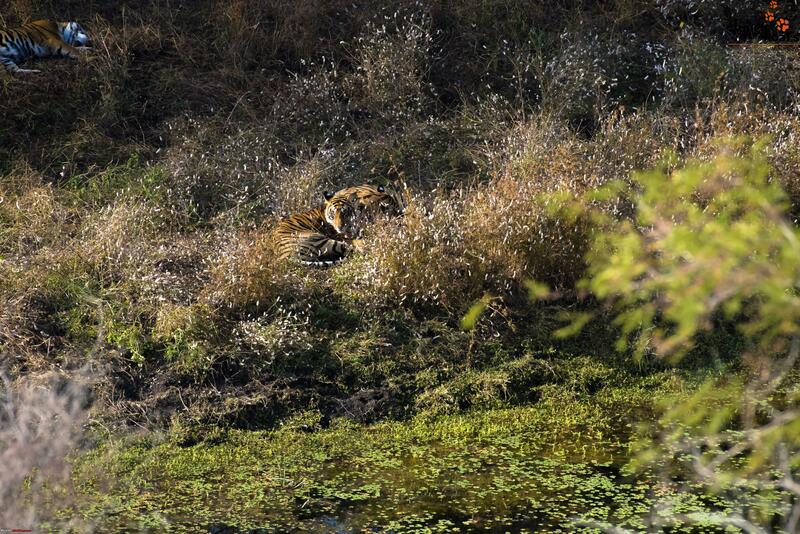 As soon as we arrived there, she returned from a water body and vanished inside thick bushes. We went to last forest check post of the zone and stopped our gypsy if anybody was looking for some break. Here I would like to mention one interesting thing. 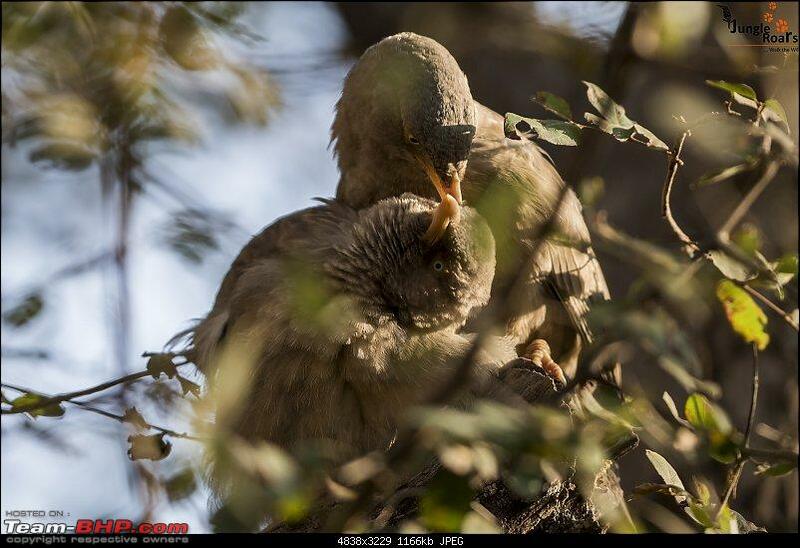 You will find lots of Rufus tree pie birds near all the check posts at Ranthambhore. Interesting thing is, they are not at all shy or bothered about human being. They will simply come and sit on your hand or sit on your head as far as you are not moving. I have not observed such behavior of the same bird in any other park. I believe before visitors used to feed them with whatever food they have and made them habitual about it. Now a days, forest department is strict here and you can not feed anything to these birds. Soon we move out of the place and again started visiting various areas for any possible sighting. After sometime, we reached on top of a huge cliff. We were just observing a dried riverbed below the cliff Suddenly our guide said “Tiger...”. 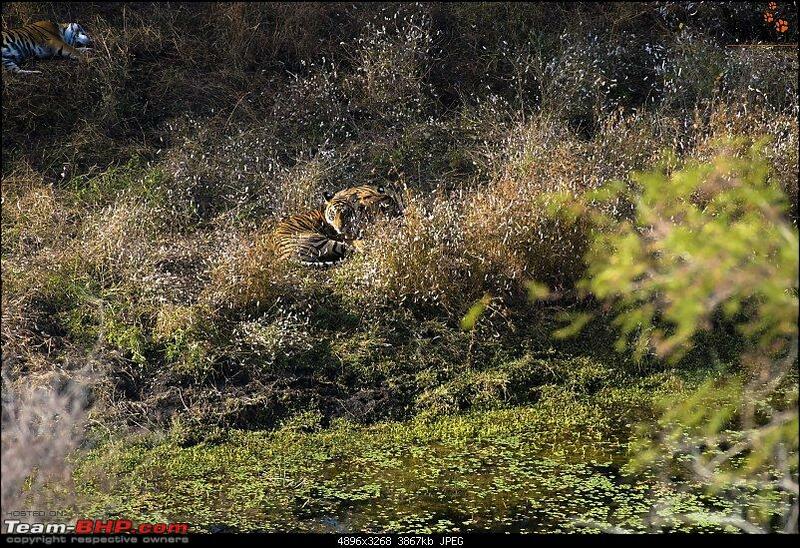 We could see a tiger resting near the riverbed. 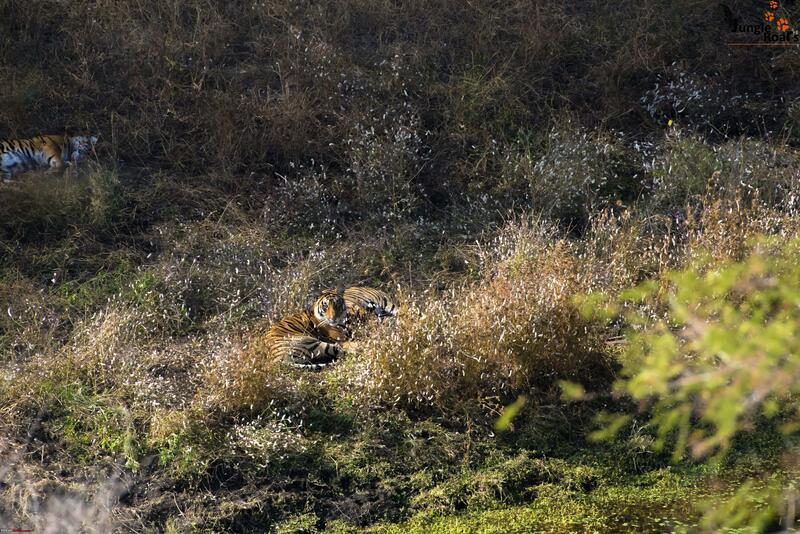 The tiger was resting far from us. 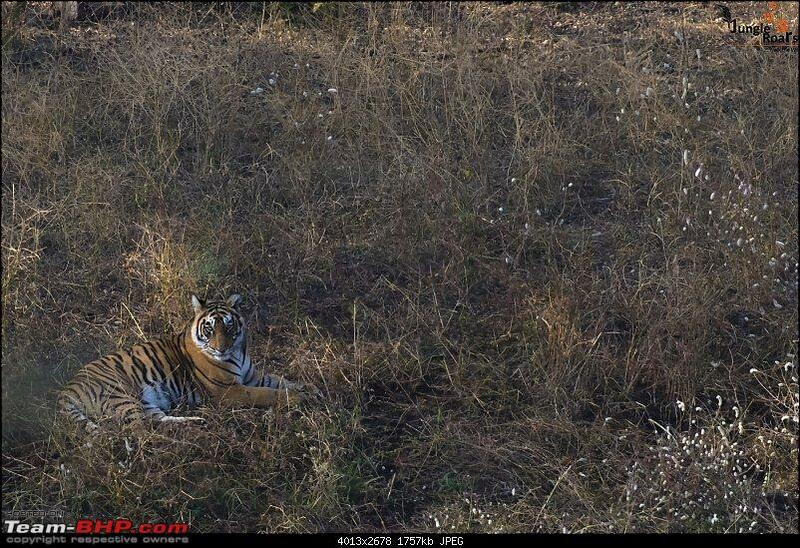 We were just watching the tiger since we were only gypsy stationed there and we were enjoying wonderful landscape along with good sun bath. Suddenly our guide whispered “Sir...doosra tiger”. 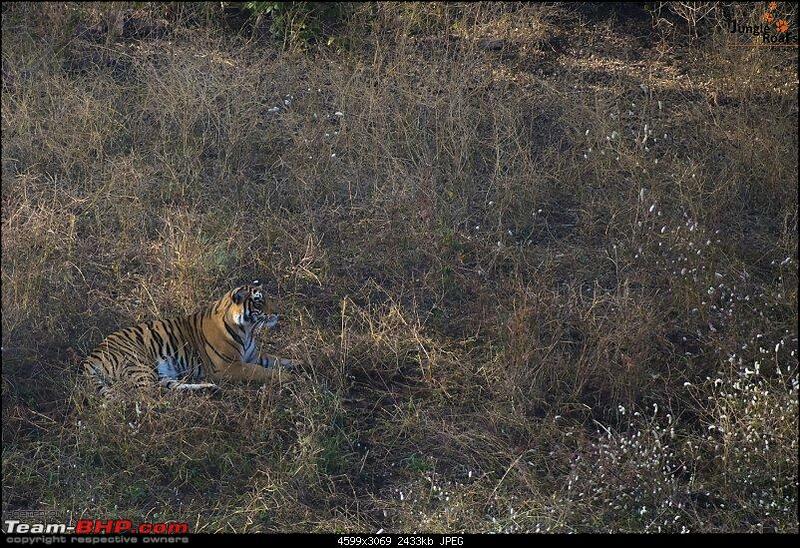 And we could see another tiger resting some 100 meters away from first tiger. 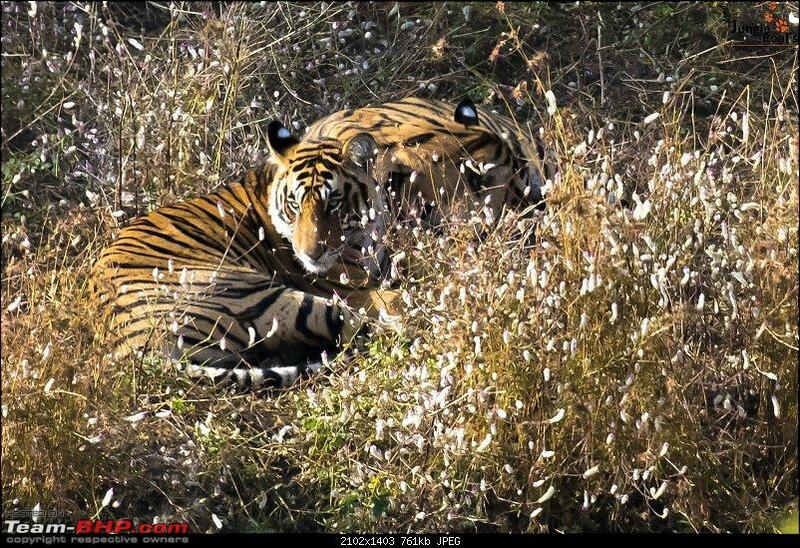 We could see the second tiger resting near a big yellow stone. We just sit there for another 10 minutes expecting any possible movement from them. Now there are very rare moments in life when your guide again says “Sir doosra wala tiger jis patthar ke paas leta hai Woh patthar nahi, teesra tiger hi hai”....I was completely shocked. Unfortunately none of us had binoculars to check things at first place. It was the experienced eyes of guide who could find it. I just zoomed my 200-500 lens and checked thoroughly and here they were. 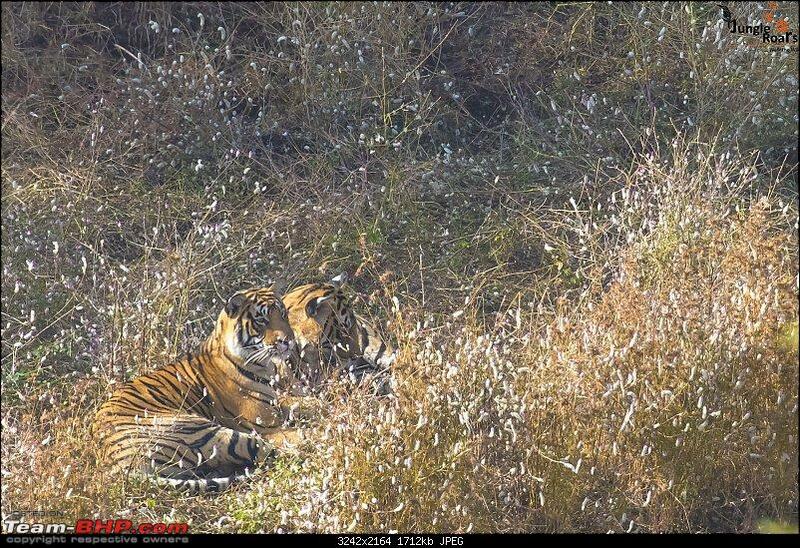 They were sub-adult cubs of T-19 also known as Krishna. By the time we grasp sighting three tigers, many more vehicles joined us. Since suddenly all these gypsies arrived, even those tigers also wake up to check what the commotion was all about. I could capture their occasional yawn, movement, eye contact. Suddenly, we found the second one. Watch how the third one is sleeping. We could only identify him after carefully observing them for some time. It was time for us to come back. I had breakfast and immediately retired for much-needed siesta for 1 hour. Today afternoon, we had already planned fort visit. After lunch we started for fort visit. We had hired safari canter for the visit since it can accommodate all. While reaching to fort, we sighted a leopard from far distance. We reached fort. Visited Ganesha temple, various parts of fort, lakes, read about its history and spent some time there. We returned at around 5:30 PM and had cup of tea. 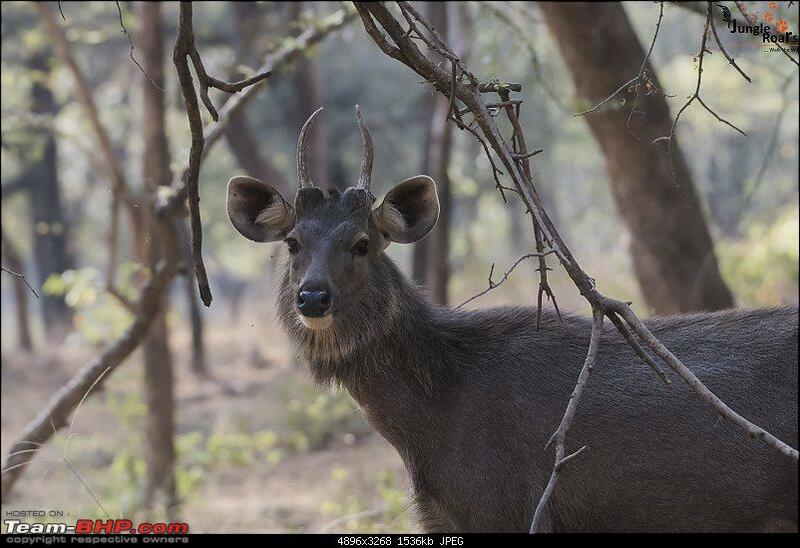 Today, we had a planned discussion on Manual Mode, Depth of field and then a movie on Sariska tiger reserve. After healthy discussion on all the aspects and campfire, we had dinner and retired for the day since tomorrow will be another safari. The day started at 5:30. We all assembled at the cafeteria to have cup of tea before departing for safari. The zone allocated to me was zone 1. we passed the Singh Dwar and made entry to our zone. 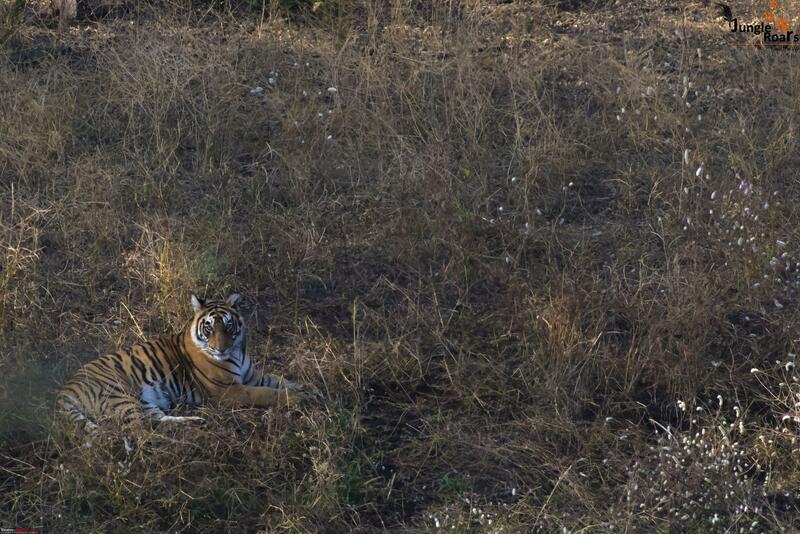 Right from beginning of the safari, we could see many pug marks of a male tiger and a sub-adult tigress moving ahead. We followed both pug marks till they disappeared near a water body without any luck. All other denizens again welcomed us but not the king himself. It was time to come out of the park. Came out, reached resort. Got ready and checked out after exchanging pleasantries with everybody . 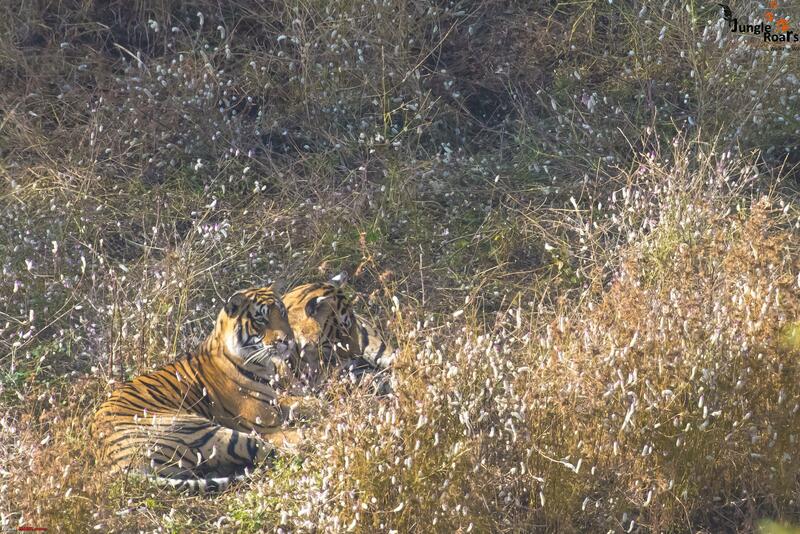 We disbursed with a promise to meet again in March (Kaziranga) and May (Bandhavgarh). I started driving back to Ahmedabad on the same route. While return, I entered the Kota city since I wanted to buy famous Kota Kachoris for home. Took the same Kota-Chittorgarh highway and then followed the same route. I had my dinner after crossing Udaipur and then drove continuously. I reached Gandhinagar around 0030 AM. 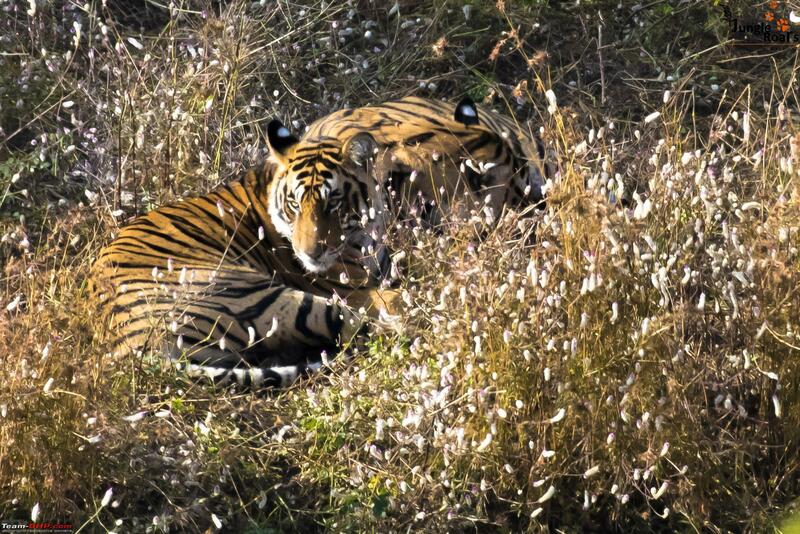 This ended a wonderful Ranthambhore visit. → Trust your drivers and guides. They are there to make your experience best. If you will be happy, you are surely going to make them happy in terms of tips so there is no reason they shouldn't make your experience memorable. 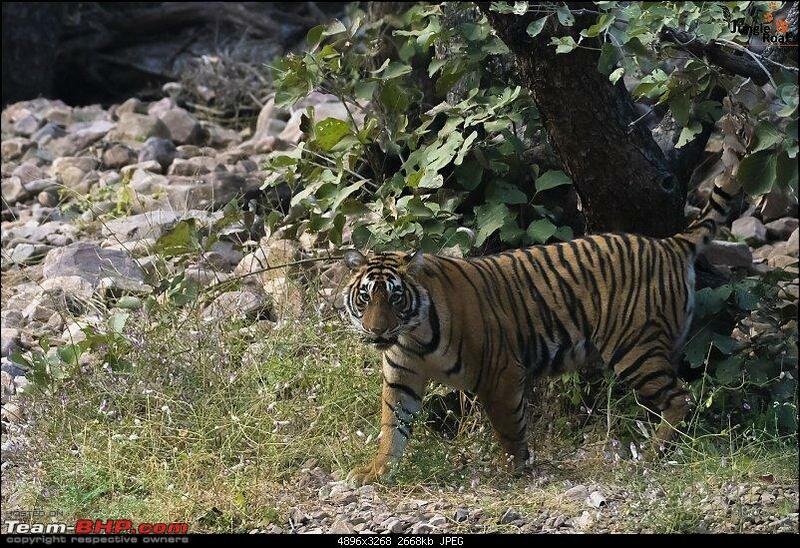 → Sawai Madhopur town is much more developed compared to other places near any tiger reserve. You will find many banks, hotels, ATMs and fuel stations in and around the town. Medical facilities are also up to mark here. For that lazy sunday evening read, before the next Monday morning blues take over! Short and Sweet. Very nice indeed! Great to read your travelogue. It is very fortunate that you could see so many tigers. We did this trip in February 2013 from Ahmedabad and followed the same route. The Udaipur bypass was in this condition and I am surprised that it is still so difficult. If you travel early morning, it is better to drive through Udaipur to reach the turnoff to Chittorgarh. We had beginner's luck on our first Canter safari and could follow a semi adult male for about half an hour. The evening safari on a gypsy did not result in tiger sighting. We stayed in Rajasthan Tourism hotel which was very good. The breakfast was superb and very welcome after the cold morning safari. Is the turnoff from Kota to Chittorgarh still in the same bad shape? I am referring to the Jhansi-Kota-Chittorgarh highway which was left incomplete at a flyover, so I had to enter Kota and the cement factory area to connect to the Chittorgarh highway. All times are GMT +5.5. The time now is 18:17.